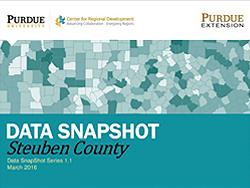 In many Indiana counties, locating relevant demographic, education, social and economic data that can offer some insights on local conditions and trends can be challenging. Even when readily available, data are commonly presented in a manner that is less practical for use by local leaders, organizations and residents. 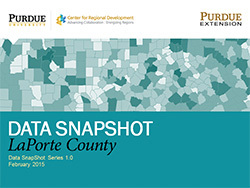 In an effort to provide individuals with user-friendly county level data on counties in Indiana, Purdue Extension Community Development has partnered with the Purdue Center for Regional Development to produce a series of Data SnapShots, reports that are designed to promote their use by individuals, organizations and agencies across the state. The Data SnapShot reports showcase a variety of demographic, economic and labor market information that local leaders, community organizations and others can use to gain a better perspective on current conditions and opportunities in their counties. To strengthen the value and usability of the information, data are showcased using a variety of visual tools such as charts, graphs and tables. In addition, key observations about the data are offered as a way of guiding users with the interpretation of the information presented. Regional Decision Maker (RDM) is a powerful suite of mapping websites and tools that enables users to make informed decisions quickly and efficiently. RDM facilitates and enables regional decision-making in a number of ways. Most importantly, it allows decision-makers to interact with data through customizable, user-friendly tools and geographic visualization. This high level of interactivity enables decision-makers to generate powerful insights quickly. The RDM data platform has been successfully tapped to advance regional planning efforts in different states, including a regional economic development data portal in the greater Peoria metropolitan area, land use and transport asset platform for 21 counties in the Greater Chicago region, and as a mapping engine for Measuring Communities, a data portal developed in partnership with the Purdue Military Families Research Institute. Measuring Communities is a “social indicators” initiative aimed at shaping community efforts to support military and veteran families. The initiative is intended to focus and propel community action, help communities track their progress and sustain attention to military issues. The goals include developing a system of indicators that address military “friendliness” in communities and facilitate dialogue about indicators that should be attended to and measured. Measuring Communities provides users with access to data tables, charts and maps for more than 100 variables across 10 domains, including health, education, housing, legal, economy, demography and community. Most data are available for all 3,109 counties in the continental U.S.
STATS Indiana provides easy, one-stop access to critical statistics for counties, cities, towns, townships, regions, census tracts and more. Hoosiers by the Numbers provides data and tools for informed decision-making by job seekers, policy makers, economic developers and other stakeholders in Indiana’s economy and labor market. The CBER Data Center offers simple, visual, easily accessible economic web tools for economic developers, community leaders, grant writers, policymakers and the general public. The Economic Research Service provides data and analysis to inform and enhance public and private decision-making on economic and policy issues related to agriculture, food, the environment and rural development. StatsAmerica gives you one-stop access to useful U.S. data sites and tools supported by the U.S. Economic Development Administration. YourEconomy.org (YE) lets you explore and learn why longitudinal establishment-level data is important if you really want to know about your economic community.